They say seeing is believing and in the video below from Kill0Your0TV, he films his Geiger counter as he approaches and walks along Pacifica State Beach (Surfers Beach), California, on December 23, 2013. 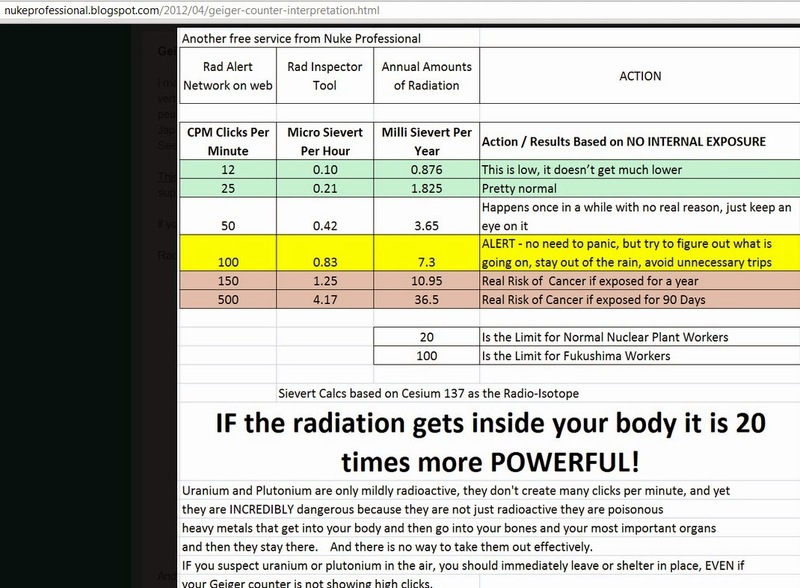 Below is a chart showing low to high radiation readings and what they mean, note the levels considered higher than normal and the descriptions to the right of them, then watch the video below. For those that claim the amount of radiation traveling in plumes across the Pacific from the crippled Fukushima nuclear plant is negligible, then you probably won’t be concerned about traveling to California and taking a swim. A warning to the rest of the readers… stay out of the water and off the beach.